Does Leicester's Richard III centre live up to the hype? A £4m visitor centre built next to the Leicester car park where Richard III's skeleton was discovered is opening on Saturday. It aims to cash in on the excitement generated by the discovery of the medieval king's bones but will it live up to the hype? "I don't know what the fuss is about," says a grey-haired woman standing outside the new attraction. "It's just some old bones". That is one problem the new Richard III attraction in Leicester faces. The other is that it has an identity issue - it is not a museum at all but a visitor centre. Which is just as well, as it has almost nothing in the way of medieval exhibits and the star attraction - those boring bones - cannot be put on display as they are to be reinterred in Leicester Cathedral next year. Sarah Levitt, head of arts and museums in Leicester, insists the lack of old stuff is an advantage. "There is such a lot to say about the story of Richard anyway," she says. "We don't have the skeleton but we do have this brilliant 3D printout of the bones and that is a really good way of people engaging with human remains, without the issues around actually having human remains on display. "And we have this amazing video about the battle, you really feel like you are with Richard in the charge, it sends a shiver up the spine." The city council bought the 150-year-old former Alderman Newton School in December 2012. Richard III was the last Yorkist king of England, whose death at the age of 32 in the Battle of Bosworth effectively ended the Wars of the Roses. His nephews Edward V and Richard of York, the "princes in the tower", disappeared in 1483 and are said by many historians to have been murdered on Richard III's orders. Shakespeare's version of events in his play Richard III added to the king's infamy. Some historians reject the heinous crimes attributed to Richard. While a small temporary exhibition was set up in the nearby Guildhall, feverish design and building work went on among the Gothic arches and beams. Iain Gordon, director of King Richard III Visitor Centre Trust, said: "Its a huge responsibility to tell this story. "And we have tried to tell it in a balanced way because you are dealing with 500 years of controversy and speculation. "We want people to come in and make up their own minds about the man and the myth." Sir Peter Soulsby, elected mayor of Leicester and the man who signed the cheques, said: "I am knocked out by it. The use of technology to tell the story is fantastic , I think people will find it interesting, educational but also exciting." But he also admitted the project had been a gamble. "There were a few raised eyebrows when I pointed out that right next to the grave site is this old school building and wouldn't that make a good visitor centre. "Of course there was risk, because when we bought this we did not even have the DNA confirmation that it was the king but there was a short window of opportunity to buy this building so we had to go for it and keep our fingers crossed it was him." The centre has two levels. Richard III: Dynasty and Death presents a story of medieval civil war, told in shadowy corners with stained glass, tapestry and concise information boards. After Richard is thunderously slain at Bosworth, visitors climb stairs to the laboratory-white Discovery zone. Here the Tudor hatchet job on the last Plantagenet's reputation is explored, along with a sweeping computer reconstruction of the church where Richard was buried. The story of the excavation is enlivened with mementoes such as the machine bucket which uncovered his leg bones in the first hour of the dig. Finally, the science which confirmed just who those bones were is explained on the walls which surround the plastic skeleton, aglow on a theatrical CT scanner. Highlights are the reconstructed head which shows how a youthful and untroubled Richard might have looked and a set of armour, which if its white colour and information stickers is to be believed, would have made the king look like a cross between a crash-test dummy and a stormtrooper. But the fact it contains the actual grave is both the centre's biggest advantage but also its biggest challenge. How to display what is on the one hand just a hole but also which once held a regal, butchered body? Paul East, from Maber Architects, which designed the centre, said: "We felt the pressure immediately. "The city council emphasised we would be dealing with the grave of a king and we were always extremely conscious of that. "We have tried to deliver something which is exciting but with the poignancy the story deserves." The room which covers the grave is plain and while a glazed floor gives a clear view of the ground, a glass column prevents anyone standing directly over the spot. Projected on to the ground is the original position of the skeleton. Richard Buckley, who led the original dig, pronounced himself satisfied - almost. "I'm an archaeologist, so I'd like to see more archaeology," he joked. "In fact I walked through the door and was instantly bowled over by the coronation chair and the visuals there, so that was a good start. "I love the 3D printed skeleton and of course the grave. 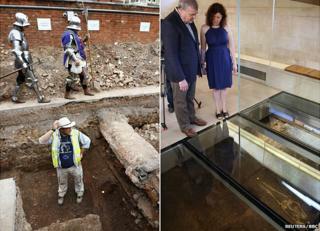 It's not easy to display the rather chewed up Leicester archaeology but I think they have got a space which will handle the crowds while maintaining a sense of respect." The centre will open on Saturday and managers have said they hope to attract 100,000 visitors in the first year. Richard's remains are due to be reinterred in Leicester Cathedral in spring 2015.